Our roots are more than one hundred years old with the idea for the parish beginning in 1873. Mr. T. P. Chandler, Jr., the architect for the old P. W. & B. railroad and a resident of Ridley Park, raised subscriptions for the building of a church. A cornerstone was laid on July 1, 1873 by Bishop Stevens at the north corner of Swarthmore and Ridley Avenues, a site more recently occupied by various doctors and dentists, and now by a photographer. The foundation walls were constructed, and the first floor joist was laid. However, Mr. Chandler, who had guided the project, moved elsewhere soon after, and building abruptly stopped. As The Bishop of The Diocese has requested me to interest myself in establishing the services of The Protestant Episcopal Church at Ridley Park, regular services will hereafter be held in the railroad station every Sunday afternoon at four o'clock, commencing Sunday, June 16, 1878. General agent of The Board of Missions of The Diocese of Pennsylvania. In those days, railroad stations were usually imposing architectural structures and Ridley Park's was no exception. It stood two stories high and spanned the tracks, where the bridge now stands. The parish was revitalized, when, all that summer and into the fall, services continued at the station. When winter came, the congregation retreated to a vacant store on Hinkley Avenue. The Bishop, seeing that Ridley Park Episcopal Church was alive, directed Mr. Bushnell to call a congregational meeting to establish a canonical organization. The Bishop further named eight men as trustees of this enterprise: The Rev. Mr. F. H. Bushnell, T. P. Chandler, S. T. Fuller, J. F. Young, plus N. L. Jeffries, H. F. Kenney, Charles Leedom, and John Smith. These men visited the lots which comprised the original site of the church, and found, that, since the Presbyterian church had been built exactly opposite, services of the two congregations, being so near, would be "mutually distracting." However, the Bishop had made a wise choice in appointing H. F. Kenney, the General Superintendent of the P. W. & B. Railroad, as one of the original trustees, and the railroad, in the form of The Ridley Park Association, was persuaded to come to our aid. They took back the original two lots, and, in place of them, gave us three lots on Sellers Avenue, the site of our present church. H. F. Kenney was supported in these negotiations by John Smith, also an original trustee appointed by the Bishop, who happened to be the Resident Agent for the railroad. In November, what material that could be salvaged from the original site was removed to the Sellers Avenue land. In December, 1878, one mason and an assistant began work on the new church building using stone from the Port Deposit quarries (one of three large donations of S. T. Fuller.) The original plans called for all of the stonework to be covered, but since the masonry work was obviously of a very high standard, certain portions of the walls were left exposed, most notably the hewn stone arch over the chancel. When one looks at the beauty of the craftsmanship, one can realize why the building took so long. Not until June 18, 1879, a full six years after the cornerstone was originally laid, was a vestry nominated and official parish records started. A congregational meeting was held at Rev. Bushnell's Ridley Park home with four parishioners: O. S. Ross, Frederick Hearley, W. H. Walmsley, and Robert Craven. Along with these four men, nine others were selected to make up the vestry. They included Fuller, Kenney, Leedom and Jefferies, as well as M. B. Hutchinson, George W. Moore, J. H. Brazier, George R. Howell and Francis G. Smith. The nominees were elected unanimously, and each, with the aid of an appeal signed by Bishop Stevens, was given the difficult task of soliciting contributions for the church (since they rather naively hoped to complete the building without resorting to a mortgage). Two other very important decisions were made at the same meeting. First, a petition for a charter was signed (which was not finally granted until May 10, 1881), and the Rev. Mr. F. H. Bushnell was immediately elected rector of the parish. Although the thirteen vestrymen contributed or solicited gifts estimated to be well of $6,000, the financial facts of life required obtaining a long of $1,500 so that the church could be completed in a reasonable time. At last the great day arrived. On Sunday, July 25, 1880 at 4 P.M. the Rev. Bushnell conducted the first "beautiful and impressive" service, to quote a parishioner. Little did this person know that the altar was made of packing cases covered with scarlet wall paper! In addition to the land, the Ridley Park Association gave us trees and plants for landscaping, and the architect contributed the tiling of the vestibule. S. T. Fuller donated all of the stone as well as the memorial window at the west end, but his most impressive contribution was the 1,015 pound bell which cost $315 and was hung in place soon after the first service. Other items given by the first vestry and used in the actual building included three windows in the apse given by Robert Craven in memory of different members of his family, and frescoes by General Jeffries. Also, several churches donated items to help us get started. Perhaps the best known of these was the baptismal font presented by the rector, wardens and vestrymen of Christ Church, Germantown, which we, in turn, gave to St. John's, Essington when that mission was started in 1903. In addition, the original alms basins came from Trinity Church, West Philadelphia. At this point, the church was to fall upon hard times. Either for financial reasons or because he wished to continue his work with the Board of Missions, Rev. Bushnell resigned the rectorship in November, 1880, taking with him "the esteem and thanks" of the congregation for his hard work and dedication. During the month of December, 1880, the Rev. Mr. T. L. Franklin was persuaded to help out as rector. Unfortunately, at this time, Christ Church could not be described as a financially attractive parish, since pew rents, which were the main source of revenue, came to only $325 annually, and the parish owed $1,500. The church survived without a rector for nearly six months, during which time, with the Bishop's approval, a lay reader, Mr. W. C. Taylor took charge. During this period (April 1881), the first code of by-laws was adopted. 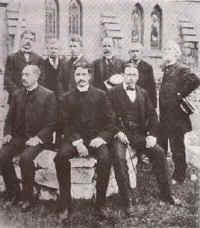 On June 13, 1881, the rectorship was offered to the Rev. George McIlvaine DuBoise at an annual salary of $500. How this was to be paid is not explained, and there is ample evidence that Rev. DuBoise was not fully paid during his tenure, which lasted until March, 1882. (The official reason for his resignation was failing health.) Thus, we turned to Mr. Taylor again, who was made a permanent appointee by the Bishop, subject to change by the vestry. Without the encumbrance of a rector's salary, various items could now be afforded. In March, 1882, a large two-bank organ was obtained second hand from Trinity Church, West Philadelphia, for $137.50 ... a real bargain, as the original price was said to be $600. Also, during the spring, the carriage shed was built at a cost of $290. For a full year, the church continued without a rector, with various attempts being made to obtain one. In March, 1883, the Rev. Mr. J. C. Craven took the services for three months. Then, in June, the Rev. Mr. Richard L. Howell took over for a month. However, no one could be persuaded to accept the call on a permanent basis, even though the remaining debt was paid off by November. During the month of the Rev. Mr. Howell's stewardship, a special event took place on Saturday afternoon, June 23, 1883. Bishop Stevens came and consecrated the new church in the presence of the comparatively few who had struggled so faithfully from the beginning. Someone may well have spoken to the Bishop at this time, because shortly afterwards, in August 1883, the Board of Missions granted the parish an allowance of $300 and on December 24, 1883, the Rev. Mr. W. F. C. Morsell accepted the rectorship, to begin his ministry in February of the following year. The Rev. Mr. Morsell was determined to try and put the parish on a more solid fiscal foundation, and shortly after his arrival in May, 1884, he instituted the envelope system, in addition to pew rentals, to obtain an effective offertory. In June, 1885, a decision was made which had great significance for all subsequent rectors - to build the present rectory on the church grounds. The cost was to be limited to $4,500, $3,000 to be raised by mortgage and the rest by subscription. It is truly amazing that the parts of the rectory fit together at all, as the method used to build it was somewhat unique. A building committee was formed which used no master contractor. Each portion of the building was put up for contract, and the lowest bid won. Even so the cost was higher than had been expected, and the subscriptions were not all met, so the mortgage had to be increased to $3,500. The building was completed in June 1886, but the rector and his family did move in until August - some say they wanted to be sure it would stand up. From this time, the numbers and strength of the parish increased and in October, 1888, its mission work started. It appears that there were many members of our church living in Collingdale, and they requested that services be held in their neighborhood. The Rev. Mr. Morsell initially conducted what were described as "parlor services" for these people, and then decided to establish "Christ Church Chapel," now Trinity Church, with the approval of other neighboring churches. In November, 1888, a lot was purchased in Collingdale, and, in December, services started in what must have been a hastily-erected hut. The vestry appointed Mr. F. M. Lorrillierre with the imposing title of Assistant Accounting Warden for Christ Church Mission, Collingdale, to look after the financial affairs. The report to the vestry of February 4, 1889 shows that $75 had been paid, and the rest would be paid off by December 8th of that year, or the property would revert back to the original owner. Nevertheless, things worked out so well that on July 10, 1889, the relations between this church and the mission were discontinued, and the mission was turned over to the Bishop by mutual agreement. Mr. F. H. Lorrillierre was able to resign his position on October 7th, along with two other members of the Collingdale Mission Committee, Charles G. Darrach, Rector's Warden, and D. B. Douglass. In October, 1889, the success of the Collingdale Mission prompted several parishioners of Christ Church, Ridley Park to request a meeting to discuss the question of a "Free Church." To their minds, "if they can do it, so can we." Thus, the annual subside of $300 from the Board of Missions, and the $150 from The Convocation of Chester, which had been granted for the rector's salary was stopped in May, 1890. Also, in 1889, the choir, consisting of 12 boys, was started. (Where are you now, lads?) There being no parish house at this time, the choir practiced in the rectory and the processed to the service. Shortly thereafter, financial troubles again hit the parish. Even though there were about a hundred communicants and the rector was paid only $600 a year, expenses were still higher than receipts. In fact, in 1891, the vestry raised the salary of the rector to $700, but he returned $300 to keep the parish going. However, in 1892, the strain was too much for the Rev. Mr. W. F. C. Morsell, and he resigned on April 24th. In June, 1892, the rectorship was offered to and declined by the Rev. R. Bowden Shephard, since our parish was still not a very attractive position. This made it obvious that the parish had to renew its financial efforts and appeals were made which increased collections considerably, The Rev. Edwin A. Gernant was elected rector, at an annual salary of $1,200, to include the cost of the organist and the choir. He started on July 20th. The Rev. Gernant decided that a parish house was essential, and he persuaded the vestry, on November 3rd, that one should be built at a cost not to exceed $2,100. On January 2nd a construction contract in the amount of $2,082.58 was made with Chris J. Urban, and on May 10th, a five-year mortgage was obtained. The building was completed in the fall, and the vestry had their first meeting in it on October 9th. At this time, the total debt to the pariah on the rectory and the parish house was about $4,500. At the end of 1893, a further financial concession was made for the comfort of the parishioners, when steam heat was introduced into the Church. The upper f floor of the parish house was fitted out for a gymnasium and equipped through the generosity of Frank L. Cooper, a vestryman. Finally, the latest modern gadgets - electric lights - were installed in the church. On June 3, 1895, we were again reunited with the Collingdale mission as the Bishop appointed the Rev. Gernant to be minister-in-charge. With these extra responsibilities for our parish, the Bishop also allowed us to appoint John J. Collier as lay reader. Collier is a story in himself. He was a vestryman for 37 years and accounting warden for 22 years. He died on November 24, 1932 after being reelected that year to a further three-year term on the vestry. At last, in 1897, two positive things happened to the rector: the rectory porch was extended to the width of the front at the insistence of the women of the parish, who bore the $100 expense, and the rector was relieved of having to pay for the choir. He still, however, had to pay for the organist. The following year, the Bishop, the Right Rev. Ozi W. Whitaker, asked our rector to take charge of a new mission in Overbrook. The Rev. Gernant accepted the position, and, in June, the vestry elected the Rev. Francis C. Steinmetz as our new rector who began his duties on the Feast of The Transfiguration, August 6, 1898. There is no question that the Rev. Steinmetz was one of the most dynamic rectors that we have had. He came to us from Old Christ Church, Philadelphia, where he had been the assistant, and he was able, through his varied university lecturing connections, to attract many notable churchmen of the period to preach at our church. In order to develop the kind of parish that Mr. Steinmetz wanted, the church's finances again required attention. In March, 1899, the envelope system was reintroduced and has been with us ever since. The considerably-improved financial situation was finally reflected in the installation on Christmas eve, 1899, of a fine pipe organ with $1,150 raised by subscription. The second-hand organ we had had for seventeen years was sent to the Washington Memorial Chapel at Valley Forge. During Steinmetz's tenure, one of the more dramatic gestures of our parishioners was made. In 1900, a new set of communion plates was made from melted-down personal jewelry donations of the members of the congregation, and the set was used for the first time on Easter Day, 1901. Basic structural changes in the church building were now necessary. Because the chancel was small and circular in shape, the choir stalls had to be relocated in the nave. This, however, made the seating capacity insufficient and plans for enlargement were drawn up in 1901 by George Nattress and Sons, Architects of Philadelphia. The changes made included the enlargement of the chancel and the addition of the transepts and cross aisle, as well as a new organ chamber and sacristy. Also, many repairs were made to the old building and tower, and the Ascension Memorial Window was installed above the Altar. The flooring was also renovated with a mosaic floor in the chancel and sanctuary and a maple one in the nave. Other work was performed on the windows, and new pews were provided to fill the nave when the new choir stalls were put in the chancel. The organ was moved from one side into its new chamber on the other side of the chancel. A new reredos and chest of drawers for the sacristy were provided, and the pulpit and lectern were installed in their current positions. Thus, the physical layout of the church as we know it was born. It is a testament to the drawing power of the Rev. Mr. Steinmetz that the entire cost of these tasks was miraculously provided for through subscriptions, gifts, a legacy of $405 from Catharine Bronson, loans, and gifts of materials and labor. However, the building modifications cost $3,660 in stone and carpentry, with a grand total of $6,113. Therefore, the vestry formed a property committee consisting of Theodore E. Kremer, the Rector's Warden, Joseph N. Fitzgerald, the Accounting Warden, and another senior vestryman, Andrew T. Goodman, and on Trinity Sunday, 1901, they sent a pledge form to every parishioner with the architect's sketch in hopes of raising $5,000. In May, 1902, a contract for the work was issued and, on June 11th, the Rev. Mr. Steinmetz, keen to get on with the job, laid the first stone. The cornerstone was laid on June 24th by Bishop Leighton Coleman of Delaware, with a large congregation, including twenty clergymen, in attendance. The speed of the enterprise was attested to in the fact that the enlarged church was first used on September 14th, only three months after work started. The new building was consecrated on November 4th by Bishop Coadjutor Alexander MacKay-Smith with eighteen clergymen, including Bishop Ozi Whitaker, taking part. Mr. Steinmetz was not only concerned with our church building at this time. He also started the second of our four missions, St. John's in Essington, which was under the direction of Christ Church, Ridley Park for over forty years until 1943. The vestry then requested from the Diocese a release from this responsibility so that future rectors of Christ Church might devote their full time to the church in Ridley Park. Because of their importance in our church's history, examples of the kinds of services held by the Rev. Mr. Steinmetz ought to be given. On Easter Day, 1903, he celebrated Holy Communion at 7:30 A.M. and a Sunday School Carol Service at 7:30 P.M., but the main service was Morning Prayer and Holy Communion at 11 A.M. In addition to four hymns, four anthems, and three psalms, everything was sung, including "Te Deum," "Jubilate," "Kyrie," "Sanctus," "Gloria" and "Nunc Dimittis." It is not recorded when the congregation got home for lunch! In 1906, our third mission, St. James, Prospect Park, was established. The origins of this mission are rather different from the previous two. Bishop Whittaker decided that the Rev. Steinmetz, with his boundless energy, was capable of looking after it in addition to his other duties, since it was a diocesan mission and therefore received funds from Convocation. After a year's hard effort, Mr. Steinmetz, on October 5, 1907, obtained permission to have the Rev. Mr. W. B. Nash appointed an assistant minister and made Vicar of Moore, subject to the Rector of Christ Church. The mission was declared independent in 1910, but in 1912, after the Vicar of Moore resigned, it was again returned to our care. Unfortunately, in 1908, our parish lost more than it gained, for, on April 27th, the Rev. Mr. Steinmetz resigned, effective June 1st, so that he could accept the election to the rectorship of Christ Church, Norfolk, Virginia. Nevertheless, the unprecedented expansion under his leadership was truly remarkable in the ten years during which he gave our parish faithful and fruitful work of the highest order. The new rector elected on August 3, 1908 was Robert W. Benedict, who remained with us for less than three years. During that time no major projects were started, and, on April 20, 1911, the rector resigned to become a missionary in Wyoming. All through the summer there was no rector, but on November 6th a call was sent to the Rev. Gilbert Pember in Walton, New York. He accepted the call and began on February 4, 1912 at a salary of $1,650, later to be $1,800. It is generally agreed that under his administration the church continued to flourish. One example of his enthusiasm was the starting of our fourth mission in the summer of 1912. Known as St. Peter's at Eddystone, it began as the others had, with meetings in various homes. In the same year, St. James Mission was put back under his control, after a lapse of several years since the resignation of Father Steinmetz. That fall, The Parish Record, a magazine for Christ Church, was started and included information for the missions. The Rev. Mr. Pember resigned on January 23, 1915 to go to St. Michael's in Germantown, where he remained for nearly twenty years until his death in 1934. During his tenure St. Michael's was united with Christ Church in 1933. On April 12th, the Rev. Francis B. Barnett from Mitchell, South Dakota, was elected rector and he started on July 1st. It was at about this time that the ideas for the parish house expansion took place. The appeal to the parishioners of May 2, 1957 states that this expansion took place in 1915. However, even though plans were drawn up that year and the Seventieth Anniversary booklet states that the extension took place in 1916, this project did not transpire until May, 1918. In 1916, methods of raising the needed money were in question. The Rev. Mr. Barnett wrote that our plans and work for "more adequate parish house facilities" were to be realized, and that further "there have been some seventy different gifts with ten or a dozen more yet to come in, in amounts ranging from 50 cents to $1,000". The money committee was comprised of Louis N. Haldt, Robert R. Kitchel, and J. J. Collier. Completed in 1917? Unfortunately not, since the notes of the Women's Guild of November 14 give the May, 1918 date as the time of the completed refurbishing. What was done? Well, on the first floor the rector's study and the choir room were added. The second floor social room was extended and one of the main attractions, a chimney, was added allowing the study and the social hall to have a brick hearth. And, in order to cut costs, windows from the old building were used. The original 1915 plans had a boys' club room underground with a stairway leading down to it, but, due to excessive moisture, the room area had to be filled in. The total project cost was about $5,500, with about $500, the final indebtedness, being paid for by the Women's Guild, which had been reformed as a separate organization and continues as such to the present. Prior to 1915, the women had been members of the Women's Auxiliary arm of the Church Club. In 1916 Charles E. Kingston resigned as rector's warden, and a most remarkable 'dynasty' was to start. Charles M. Chestnut was appointed to this post by the rector, and he continued for nearly 25 years until 1941. 1917 was an odd year for Christ Church. Toward the end of 1915 the rector suffered an illness which confined him to a wheelchair for many months, including the Christmas season. He slowly regained his strength and with the entry of America into the war, he was determined to do his part. He therefore left Ridley Park in May 1917, and on June 1 reported as chaplain of Roosevelt Hospital Unit number 15, a field hospital unit in France. He was given a year's leave of absence for this service. Incidentally, he was still paid as rector, but in September the Red Cross paid his $1,800 salary. During the summer, the Rev. William H. Anthony was sent to be our priest. Then, on November 25th, the Rev. Henry S. Bedlinger from Salem, Massachusetts arrived and remained with us until Francis Barnett returned to the pulpit in 1918. His return, however, was short-lived, for, on August 30th, he resigned to accept a Captain's commission with the Army Chemical Warfare Service. We haven't included much about our organists in this account, but, of course, they were indispensable to our church. In December, 1917, the vestry appointed Robert M. Stults to the position and he remained our organist until 1930. He was a composer and arranger of operettas so popular at the time. His musical efforts included "Betty Lou," "Folderol," and "Hearts and Blossoms," and his "hit tunes" had such saccharine-sounding titles as "Love's Threads of Gold," and "The Dream Girl of My Heart." After the period of over six months without a rector following Rev. Barnett's resignation, we persuaded Dr. Charles Eder, the curate of St. Martin-in-the-Fields in Chestnut Hill to accept our call. He was elected rector on February 10, 1919 and took his first service on February 23rd. Women's Guild decided to raise money to reduce the mortgages on the parish house. At the May 22, 1920 meeting they decided to pay off the approximately $1,000 owed by giving $750, if the vestry would contribute $100 in addition to lending them $150. So, in September a large rummage sale was held at Doughtery's Store in Leiperville to help raise the money. It was such a large undertaking that two members of the Guild, Mrs. Mohr and Mrs. Baker acted as store detectives! It was a sign of the times that the old carriage shed was converted to a garage by E. Roberts Hall in the fall of 1920 for the use of the rector. In fact, the finances of the church were at a peak during these years. The rector's salary was increased from $1,800 to $2,100 on February 20, 1920, then to $2,400 on March 7, 1921, and to $3,000 on January 11, 1924. It was also a time of many memorial gifts, with the Memorial Committee in 1921 preparing a plan for future installation of the memorial windows and the renovation of the sacristy. However, the best was yet to come. During the summer of 1923, a fund was started to pay off the $2,400 still owed on the rectory. This fund was set up to observe the fiftieth anniversary of the first efforts to establish a church in Ridley Park. The church membership was so confident that the first $1,000 raised was sent to missions and by October, 1923, a further $1,125 had been raised against the $2,400. In January, the Women's Guild added $400 to the fund, and, on March 4, 1924, at what was called a "Jamboree" in the parish house, the mortgage was burned with appropriate Shrove Tuesday ceremonies. At set of chimes offered by Mr. John L. Hawthorne was declined at this time, as the church tower was found to be too small to accommodate them. But, since we were well off in 1924, we felt able to decline gifts that year. We were even able to give $2,000 to missions, and were also heavily involved in gifts of time, money, and materials to Taylor Hospital. Dr. Eder obviously felt that he had done all that he could for us, so, on February 2, 1925, he resigned to become the rector of Grace Church, Mount Airy in Germantown. On October 27, 1925 the vestry sent out a call to Frederick Warden of Trinity Church, Moorestown, New Jersey, which he accepted on November 20, to start on the first Sunday of 1926 on January 3rd. An event took place in 1926 which was to have an effect on our church for many years to follow. Since the very beginning of the church, The Women's Auxiliary to the Board of Missions, a group dedicated to the operation of the church, was of great prominence. One of their leading lights was Charlotte M. Woodruff, who owned 17 Rosemont Avenue in Ridley Park. When she died in 1926, she willed it to Christ Church with the only condition being that the proceeds be known as the Mr. and Mrs. Robert M. Woodruff Memorial Fund." The original executor of the will died, and it wasn't until the following year that we eventually obtained the money. The property was sold for $6,500, but by the time the lawyer's fees were paid, this was reduced to $5,636.19. Initially, $5,600 was invested in a bond which paid 4�% interest but then $5,000 was transferred to a bond which paid 5�%. Unfortunately the company which offered this bond went bankrupt, and no interest was paid for two years. On occasion, the relatives of Mrs. Woodruff have asked what we can show for her money other than the bronze tablet in the church. The fact is, that without it our parish would have no doubt ceased to exist, and, even though the value of these bonds, by 1936, had dropped from $5,000 to between $100 and $10, eventually their value rose to $375. Thus, it is a lesson to all of us that the endowment fund may not be very important in good times, but in times of trouble it can be invaluable. Suffice it to say that the euphoria of the early 1920's at Christ Church turned sour in the late 1920's as our debts grew larger. In 1928, the deficit was about $1,500 and it became a standard practice of the vestry to issue an annual year-end appeal in order to obtain funds to cover the budgeted deficit. Furthermore, to pay the various creditors, another practice of juggling the Woodruff Fund was started, using monies which were not initially invested in bonds. To turn to brighter subjects, in October the rector engaged a young man, one George E. Condit, as the new organist. In February, 1936, Mr. Condit was recommended by the rector and vestry as a candidate for Holy Orders, and he later became the rector of St. Matthias Church, West Oak Lane, Philadelphia. Also, in 1931, the roof was financed by a rather novel method: the parishioners and friends bought 10,058 slates at a cost of fourteen cents each, or $29.96 per 214 slates, which made a square of a particular size for ease of installation. Two other items occupied the minds of the vestry at this time; how to pay for the coal which was, of course, the main method of heating, and how to afford an organ tune-up which, apparently, had become essential. To say the least, financing such items was still a major problem. Even the Rev. Mr. Warden did not always receive his annual salary, but, somehow, the church kept going. Donations of coal were made and paint and labor were given by two parishioners. In addition, the Diocese was concerned because we were unable to pay the pension fund, and to compound our problems, our mission in Essington was unable to pay us what they owed. Therefore, the method used by the vestry to help raise funds was the "Ever Member Canvass" in which they contacted everyone in the parish for pledges. Meanwhile, the Sunday School superintendent appealed for more heat and, with no coal available, wood was burnt. This, however, ruined the heating system and a new one was needed, whatever the cost. Now, World War II was upon us, and we added wartime problems to our other encumbrances. Rev. Warden was suffering ill health, and the Rev. James M. Collins of the Philadelphia City Mission took our services. Then, on May 7, 1943, Rev. Warden resigned, effective June 30th. The bonds of the Woodruff Fund were finally sold for $635, and an era was over. Father Warden had fought and suffered for our church for over seventeen years, which must have seemed like an eternity to him at times. He was promptly elected Rector Emeritus and lived two more years until his death in September, 1945. Once again, filling the rector's position of Christ Church was not going to be easy. It was first offered to the Rev. Albert F. Fisher, Rector of St. Matthias Church, West Oak Lane, Philadelphia, but he declined. Then the Rev. John R. Bill 3rd, of Moscow, Idaho was called, and again we were refused. The third time we were fortunate when the Rev. Albert Ormsby Judd, Associate Rector of St. Gabriel's Church, Hollis, New York, accepted at an annual salary of $2,700, some $300 less than what we had paid the Rev. Mr. Eder twenty years before. The Rev. Judd joined us on October 1st, and kindled a new spirit throughout the parish. A fund to purchase a new organ was started, and Walter T. "Butch" Boyer, our organist, began a musical revival with a volunteer choir of men and women. In 1944, the financial situation had improved to the extent that an effort was made to revive the Woodruff Fund once again in the form of new bonds. Also, the rector's salary was raised to $3,000. In 1945, it was decided to redesign the Church Bulletin, and Mr. Parke Heston broached the subject of a memorial chapel for his parents, Mr. and Mrs. Thomas L. Heston. The area in the south transept which he proposed to use had the organ pipes in it at the time, but the pipes were removed, and the chapel was completed, dedicated, and in use by February, 1946. In October 1946, the by-laws were again amended granting a greater democratic voice in the election of the vestry and more conformity to the Canons. Also, throughout the year, discussions regarding a new organ continued. Finally, a contract was submitted by M. P. Moeller of Hagerstown, Maryland in the amount of $5,945 plus federal excise tax, and, since the organ fund had reached about $2,000, it was decided to borrow $5,000. Thus, by 1947, we had a new two-manual pipe organ with great, swell, pedal organs and numerous pipes. That same organ, with additions and alterations, is still filling the church with beautiful music today. On February 2, 1947, the Adult Bible Class and coffee hour, under the direction of Mrs. Frederick Bonnet, was instituted between 10 and 11 A.M. on Sunday mornings. Already, changes under Father Judd were becoming apparent. In addition to the efforts we have described, he instituted many other improvements in the property, some of which were absolutely essential. He also added to the congregations, virtually doubling the attendance at every service. In addition to his other activities, he was an Associate Editor of The Church News from 1945 to 1948, and one of his most notable contributions was the memorial window program. Mr. Parke Heston, in the March 1953 Church News, described the way in which the new windows were incorporated into the existing design by Willet Studios of Philadelphia to form an iconography the Story of the Life of Christ. The subjects were fixed, and the donors picked the event in Christ's life that they wished to sponsor. In the summer of 1949, Mr. Judd left us to go to St. George's, Maplewood, New Jersey. We offered the position to the Rev. Gary Price, an assistant at St. Mary's, Ardmore, Pennsylvania, but he preferred to go to Trinity Church, Arlington, Virginia. He was the last man to refuse our rectorship. We turned to Father William Loane of Christ Church, Greensburg, Pennsylvania, and he answered our call on November 1, 1949. In 1950, the weekly parish bulletin was again revived to keep us informed of church happenings. Also, the work done by Earle Deppich to keep the church insurance up to date was proven a wise decision, as the garage suffered damage in November of that year. Further storm damage was to occur when, in 1954, a hurricane inflicted about $900 in damage to the church steeple and roof. Once again, our insurance proved invaluable. March of 1951 saw the vestry recommendation of Holy Orders for the Rev. Mr. S. A. L. Thomas, the former pastor of the Methodist Church of Ridley Park. In September, 1951, Father Loane resigned from our church to become the rector of St. James Church, Downingtown, Pennsylvania. The call then went out to Father William Dunphy, and he was installed by Bishop Hart on December 17, 1951. Father Dunphy is, of course, a brilliant theologian, having been associated with the Philadelphia Divinity School, and it has been suggested that the duties of a parish priest were difficult for him. He preached what he called the three "D's"; namely Doctrine, Devotion, and Discipline. Father Musselman has said that his own task has been made an easier one because of the religious foundation laid by Father Dunphy. We might also note here that, in 1955, after considerable dialogue with the borough, a sign was erected on Chester Pike directing people to our church. Democracy was once more furthered in 1955 when by-laws were enacted expanding the vestry to twelve men, with a one-year lapse required after each three-year term. These changes were finally passed in April of 1956. The first gift to the memorial building fund was given in the fall of 1955. Eventually, this led to a serious discussion by the vestry in March, 1956 of a badly-needed program; a program which fell to Father Musselman, as Father Dunphy resigned because of his teaching work at Temple University. He did, however, stay in the rectory until July 1st, and continued services until the end of that month. After the confirmation service in June, gifts were presented to the Dunphys by the church school, the Altar Guild, and the Rector's Warden, on behalf of the parish family. Father William S. Musselman (or Father Bill, as he is affectionately known by all) was called in March, 1956 from The Church of Our Savior, Jenkintown, Pa. and began his duties on August 1st. The Office of Institution was conducted by Bishop Hart at an 8 P.M. service on October 24th. All of Father Bill's friends from Norristown and Jenkintown were in attendance to hear the letter of Institution read by the Rev. Charles R. Long, the executive secretary of the Diocese. A reception followed the service with Earle Deppich as the master of ceremonies, and with many notables of the borough present. The need for a new parish house was soon to occupy the mind of the new rector and parish family. Ironically, this venture was initially given birth by a national program of our branch of the Anglican Communion called "Builders for Christ." Largely as a matter of convenience it was the custom then for the finance committee to meet several times a month to count the offerings. These meetings took place in the homes of the committee and each took a turn at playing host. It was the standard tradition, after the money was counted and posted, for a repast consisting of elaborate spreads of cold cuts and cheese, along with liquid refreshment, to be served. It was into such an atmosphere that Father Bill came one Sunday afternoon in late 1956, seeking counsel as to how we, as a parish, could raise our assessed goal of $5,000 for "Builders for Christ." One individual present had just enough to drink to speak most candidly. As his dissertation is now recalled, its blunt message has this drift" "I'm sick and tired of talking about peanuts," he said. "For years we have been talking about doing something about fixing or rebuilding our parish house. Let's stop talking about it and do it!" The above is but a brief condensation of a lengthy, fiery presentation. The direct consequence of the challenge it presented fostered a commitment on the part of the vestry to act. Countless meeting were held which eventually resulted in our raising over $100,000 for the building of a new parish house, the purchasing of the Pearson property adjacent to the rectory and including our full assessment of $5,000 to "Builders for Christ." On April 17, 1957, Father Bill wrote a letter to some fifty men asking them to act as canvassers for our building fund drive. The letter stressed Faith, Prayer and Sacrifice. A Loyalty Dinner was held on May 2nd at the Prospect Park Fire Hall to which our entire parish family was invited. On May 5th the canvassers started to make visitations to the homes of our parishioners. As a result of the canvass, a total of $75,000 was raised during the three year pledge period. All this was done through the help and guidance of Russell Stevens, whom the vestry had employed as a professional fund raiser. Mr. George Savage had been engaged as the architect, with the firms of Damon and Foster as surveyors. It was the original intent to keep all costs, including construction, fund raiser, interest payments and extras, under $100,000. It was a depressing night for many when construction bids were opened with all the bids themselves exceeding that figure. By eliminating a number of items such as a coat room on the first floor, a men's room on the second floor, steam radiation, steel stairwells, etc., the total cost for construction came to approximately $95,500. The firm of Martin Brothers of Drexel Hill was awarded the contract. Already we had exceeded our goal of $100,000. By the time all was finished including interest payments and all costs, it is estimated that over $120,000 was spent. To liquidate our debt at the completion of the original three year building fund pledging campaign, another Loyalty Dinner was held. Our people were asked to continue their special pledges to this fund and two years later the building fund treasurer, George H. Derbyshire, joyously announced that all debts were paid. On November 3rd, 1957, the ground breaking ceremony was held for the new building. Ropes were laid to indicate the location of the plant. The Rev. Henry S. Paynter, the editor of The Church News, officiated at the ceremony. The next milestone was the laying of the cornerstone by the Rt. Rev. J. Gillespie Armstrong, then the Suffragen Bishop of the Diocese. He was assisted by the Very Rev. Peter VanDerHeil, the Dean of the Convocation of Chester. Four major items were placed in the cornerstone - a cross, a bible, a Book of Common Prayer, and a copy of the previous listing of our parish published in June, 1949, on the occasion of our 70th anniversary. This was written by Mr. Charles M. Chesnut and added to by Mr. William Mohr. Various other items were placed in the cornerstone, such as building plans, our campaign literature, bulletins and a list of contributors. The building was completed in less than a year and on September 14, 1958, it was officially dedicated the the Rt. Rev. Oliver J. Hart, Bishop of Pennsylvania. During the construction the church school continued with classes held in the Lord's house, the rectory and the Tomlinson house on Poplar Walk. One condition of the contract was to keep a toilet in operation during the construction period. Many will remember our raised outhouse. Also during this period, in the best tradition of business as usual, our Parish Fair was held in the Ridley Park Auditorium. In order to finance this enterprise a construction loan of $60,000 was obtained. In addition, a balloon mortgage was secured of $20,000 on the rectory and the newly acquired Pearson property at 110 Nevin Street. The repayment of these loans was made from our building fund treasury. We have already noted the need to lengthen the original three year pledge period. The final payment on the construction loan was made in April, 1962. The rectory was freed from debt in January, 1963, with the original balloon mortgage reduced to a single one on our property at 110 Nevin Street. Rental income eventually paid off this in February, 1969. Even while these debts were being paid, the parish was considering further improvements; completion of the organ, another approach from the altar rail back to the nave, a chapel, three additional pews in the south transept, and an additional pew in the choir stalls. In June, 1963, a plan to do these five tasks was enacted at a cost of approximately $35,500. Still, we were not finished. The common room was refurnished and redecorated at a cost of $3,800 and dedicated in September of 1967. But we were not self-centered at this time, for a pledge of $2,000 was also made to the Diocese expansion of All Saints Hospital. We would like, at this point, to make mention of the Given house (or the Pearson house) at 110 Nevin Street and how we obtained this property. The house was sold in 1908 to Charles L. Pearson. When he died in 1957, he willed it to his son Gilbert from whom we bought the property on August 20th for $12,327.50. We took out a fifteen-year mortgage for $10,000 at 5% interest and, in 1963, the house was remortgaged for $7,000 for 10 years at 5%, thus reducing the payments. This was paid off completely in 1969 with funds borrowed from the general fund. The original reason for buying the property was for future expansion. However, since any such expansion was ultimately decided against, and the property did not bring in much income, it was finally sold in February 1979. We might also mention that the 80th Anniversary of our parish was celebrated with a corporate communion service on Ascension Day, May 7, 1959. The increase in the communicant strength of the parish was shown in the doubling of our membership in the twelve year period between 1948 and 1960. Father Bill cautioned against complacency in this matter. At the same time he praised the vestry for their dedication, especially with building projects in which we were engaged and which were now bearing fruit, since groups such as the Girl Scouts and Alcoholics Anonymous were able to use our new parish house. As we had started four missions, so did we also start the careers of four priests in the service of God. Namely, in the 1930's, George Condit, and in the 1960's, Floyd Adams, Joseph Hess and Frederick Harjes. On December 16, 1961 Joseph Hess was ordained a Deacon. Father Joe, as he was known, was then the superintendent of our church school. At the same time, Floyd Adams was in his first year at the Philadelphia Divinity School, with the assistance of a grant from our newly-formed educational fund. June 13, 1964 was a great moment in the life of Floyd Adams. He was ordained Deacon at the Church of the Savior in West Philadelphia. He began his active ministry at St. Martin's Marcus Hook. It's interesting to note that at this time there was a severe shortage of clergy. This picture was to change in the next ten years. The educational fund was used to help Joseph Hess continue his studies at West Chester State College. We also had two more seminarians in the next two years; Michael Campbell and Barton Berry. In April, 1962 the building fund was given a boost as the construction loan was cleared, and on January 21, 1963, the mortgage on the rectory was paid off with an appropriate mortgage-burning ceremony. Father Bill then noted that our area was changing with the erection of about 500 apartment units and he stressed the challenges which this presented to our church. On February 21, 1965, an event took place which gave promise of a hope which is still a long way off. An ecumenical breakfast was held at MacMorland Center of Pennsylvania Military College (now Widener University) in Chester, after 8 A.M. services at the five parishes of Ridley Park. These services and breakfasts were to continue for the next few years. The year 1965 also brought the new illuminated sign on the church lawn, and in 1966 the summer service was moved from 11 A.M. to 10 A.M. after the termination of our summer exchange program with St. James. In the fall of 1966, a reception was held for the Musselmans to celebrate their tenth anniversary with us. One item presented to them was a color TV. We wonder how many Eagles games were watched on it. In 1967, the six convocations of the Diocese were dissolved and twelve deaneries were formed. So we left the Convocation of Chester for the Delaware Deanery, and the first dean of our new deanery was the Very Rev. William Musselman. In the fall of 1967, the common room was completely refurnished, a major project which had been a long time in the making. In May 1968, we made two donations to local parishes in financial trouble; $1,000 to St. Luke's, Eddystone, and $500 to St. Stephen's, Norwood. In order to help with the summer services of 1968, Father Bill engaged the services of Father Paul Westman who, along with his family, has become a beloved friend of ours, and not just because of the length of his sermons! February 8, 1969 saw the ordination of Frederick Harjes as a deacon and Joseph Hess as a priest. The Rt. Rev. Robert DeWitt presided, Father Penny preached the sermon; Father Floyd Adams acted as the master of ceremonies. Jack Kalodner, former Sunday School superintendent, was the epistler, and a reception was held in the parish house. In the meantime, other matters required attention. The original roof of the church, which had been patched for so long, was replaced at a cost of about $13,300. The nails holding the old slates were rusty and in high winds one could count the missing slates. The new roof was held down with aluminum nails to avoid rust and Nathan Quinn, our always-industrious property committee chairman hoped that it would last for at least 75 years. In addition, lead-covered copper plate was added to the steeple. Other items, such as a new door for the church, were added at a total cost of $18,000. This amount was paid with $6,000 from the reserve contingency fund and $12,000 borrowed from the Bishop's Revolving Fund over four years at 3�% interest. Father Bill was given more responsibility when, on June 19, 1969, he was named a chaplain to Taylor Hospital. Actually, an entire book could be written about our relationship with this hospital; from its inception in 1909, as a tiny three-bed facility in the home of Dr. Taylor on East Hinkley Avenue, to the ultra-modern complex of today. We can be truly proud of our efforts over its entire existence. In 1970, visits were started to the ladies of the Conner-Williams Nursing by the visitation committee. This might have been to even up the visits to the men of Fair Acres, started the previous year. In 1971, two of our most faithful servants left us; Father Joe Hess became rector of St. Peter's Broomall, and, in October, our longest-serving sexton, Charles Townes, retired after 25 years. May, 1972 marked the fifteenth anniversary of the Musselmans at Christ Church, and Father Bill and Janet were presented with a belated honeymoon trip to Bermuda. In the fall of 1973, the vestry set aside the courtyard to be a memorial garden. Gifts were used to improve the drainage, to place a walkway, and to improve the landscaping. In 1974, the last modification to the organ was completed with the addition of another rack of 61 pipes at a cost of $1,400. We know that September 7, 1974 will stand forever in Father Fred's mind, for that was the day of his ordination. At no time did he ever complain about the drudgery of his studies or his struggle to be allowed to attempt the task. Instead, his remarks were always augmented with his sincere thanks to members of the parish for their encouragement. What an example he has been to all of us. In 1975, the old garage was replaced at a cost of $6,210, and the gate was added to the memorial garden. The statue was placed in the garden in 1976 and during that same year a new roof was put on the parish house. Another milestone was then reached by Father Bill; his twentieth anniversary. This time, he enjoyed a three-week tour of Canada and his return was even noted by the Bishop, who attended the service. The year 1977 brought modifications to the rectory; a new heating system and a paint job at a total of about $10,200. Also, we again changed the pump in the church basement as the drainage battle continued, and a new one began - termites. We also received permission to borrow money from the Bishop's Revolving Fund; this time $10,000 at 4% interest. These funds were for improved lighting and electrical fixtures plus renovations to the kitchen and bathroom in the rectory. In addition, we spent $5,700 on concrete work around our plant. As you read this account, perhaps you feel that we have not concentrated enough on our more recent history. It's just that it's hard to realize that what happens today is the history of tomorrow, and we remember only too well the day-to-day "history" of past years. However, our record-keeping will certainly continue in order that we may add pages to the unfolding story of Christ Church, Ridley Park. It may not be very palatable to us, but the fact is that most of the projects we do today are not very new. Since the early days of our parish, we have been involved in Outreach and at times when we had considerably less money than we have today. Take any year and you can find instances of charity and hard work by members of our parish. If we were to chronicle all our efforts it would fill an encyclopedia and make us far too self-satisfied. We have picked out certain incidents from certain years for no better reason than that they have been documented, and they in no way, represent either the best or the worst of our efforts. Some of our many projects both inside and outside the church include the vestry, the Altar Guild, Women's Clubs and Men's Clubs, property and building committees, choirs, church schools, Acolyte Guilds, work with alcoholics, fundraising such as the Church Fair, young people's groups, missionary groups, seminarian support, United Thank Offering, support of Taylor Hospital, Meals-On-Wheels, ushering, memorials and endowments, sewing groups, conferences ... to name but a few. Some of these projects have had their ups and downs, but they give testimony to our efforts. To give you an example, let's go back to the year 1915 for some of the things going on in just the month of April. � 2000, 2001 John A. Bullock III.